There are few things more annoying then arriving home from a great vacation to discover your vacation snaps (pictures) are not as great as the vacation. As photos are a great way to refresh and share memories, you naturally want the best photos you can possibly get on vacation. With today's digital cameras becoming the equivalent of our grandparents' Kodak Brownies, there is no reason that all of us can't capture moments we will delight in for years to come. There it is. The one thing you have been avoiding since you got your camera is the most basic tool you have at your fingertips to help you get great shots. In our gosh-what-does-this-button-do approach to technology, most of us have disdain for giving our camera manual all but the most cursory of glances. Read the manual. Familiarize yourself with all the parts of your camera. If the print in the manual is small, go and see if the manufacturer has published it on-line. That way you can zoom in the text as large as you want. If your manual is relatively slim, pack it away in your camera bag or purse. If that is not feasible, then take some notes on a 3x5 card and stow it away for future reference. Your camera manual is your friend. You will find that your camera manufacturer actually wants you to succeed a taking the best pictures you can with your camera. Most manuals also offer a quick tips section to getting better shots. Also, take a moment and clean your camera lens and viewfinder. You might also want to invest in a few in-expensive circular polarizer filters for your camera lens. With these snap on, different colored round plastic discs, you can immediately change the color contrast in your photos, including black and white photos. They also help to improve definition of whatever you it is you are snapping a photo. Yes, you will want to take plenty of pictures of your traveling companions, but Cousin Harry and Aunt Maggie do not have to be in every shot. Moreover, when they are, make the shots interesting by thinking about composition of the picture. Shots taken in natural light such as early morning and late afternoon are the best times to get shots of people, their faces, and their reactions to their environment. Move to get a great vacation snap. Do not stand in the first place your feet touch the ground to capture that breathtaking waterfall or that imposing church against a cloud swept sky. Try different angles and be careful of reflective light and using your flash on your camera. To be certain you are getting a good shot when reflective light might be an issue, take a shot without your flash and then one with your flash. If you see something that interests you such as the colors in a beautiful rug or a field of flowers, then take the picture. This is your vacation and you want to remember local colors, objects, and people to capture the ambiance of the place you are visiting. Look for moments that can add depth, color, and texture to your photos. Remember to try to change the angle of either the shot or the camera to get shots that are more interesting as well. This rule has been around a long time and the reason is because it is a great rule and can help you improve vacation snaps in just a short time.The Rule of Thirds is basic - the actual subject of a photograph will appear better if the focal point of the camera is not set dead center on the subject. That is the subject should be on the one-third to two-thirds line of the photo through the viewfinder. Many digital cameras have a grid available to turn on or off and which will superimpose itself (invisible in the actual shot) over the photo in the viewfinder. You can use this grid if you like to help you line up your shots. Using the Rule of Thirds, you will get more background in the actual shot, which is generally more visually pleasing and gives the photo a dimensional quality about it. 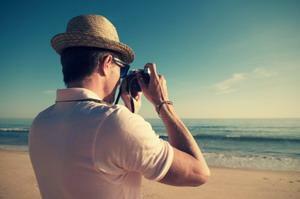 Taking great vacation snaps should be part of every traveler's experience. With some practice, some experimentation and some study, you should find yourself taking photos as good as or better than any professional photographer can produce!